VGA output, connect the VGA devices using a VGA cable. HDMI output, connect the HDMI devices using a HDMI cable. DVI output, connect the DVI devices using a DVI cable. 1. Can only convert signal from Mini DisplayPort to HDMI/DVI/VGA. This is not a bi-directional adapter. 2. Only use one output port at a time (can not use simultaneously). 3. This adapter is not compatible with USB port. 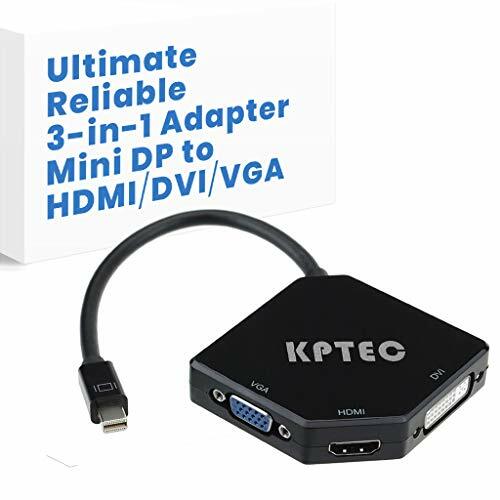 The lightweight and portable adapter for connecting a Mini DisplayPort (Mini DP or mDP)/Thunderbolt port compatible computer to a HDTV, monitor, or projector with VGA/HDMI/DVI; A separate VGA/HDMI/DVI cable is required. Transmits both audio and video from computer or tablet to HDTV display via HDMI; Supports video resolutions up to 1080p (Full HD) and flawless audio pass-thru for uncompressed digital 7.1, 5.1 or 2 channels (no audio output via DVI or VGA). Support Mini DisplayPort 1.1a input and DVI/HDMI/VGA output. Compatible with Apple MacBook Pro, MacBook Air, Surface Pro 4, Surface Pro 3, Microsoft Surface Book and other devices with thunderbolt port. Please Note: Not compatible with 2009 Early Macbook. 1 Year Warranty and 30 Days Money-Back Guarantee makes you worry-free for any quality-related issues. If you have any questions about this product by KPTEC, contact us by completing and submitting the form below. If you are looking for a specif part number, please include it with your message.